Drop-In: The Original Event, Four Years Running! Well, Hello Crafty People! I thought I would grab a cuppa and sit down to talk (well, write) to you about our Drop-In. The Unravel & Unwind Drop-In has always been a staple of our events calendar for the past four years. Four years? Yes! Four years! We have been open for that long, saving a seat for you complete with time and space to work on your crafty obsessions in the company of like-minded people. Crafting can be a solitary activity. There are homes all over Britain with little craft corners, craft cupboards, or even entire rooms for the lucky ones… I have been jealous of them for some time! But all of these provisions have the same thing in common: They’re at home. Yes, home. You know, that place where the neverending ironing basket stares you in the face, the TV full of recorded programmes just begs you to sit and watch… the phone could ring at any time, same in the case of the doorbell… all of which pulls your focus away from what you really want to be doing; Creating! 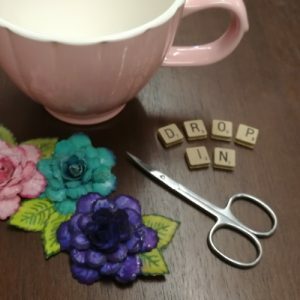 Enter the Unravel & Unwind Drop-In. We do not have an ironing basket. We do not have a sink full of dishes, although the occasional mug does get used.. the only doorbell that you will hear will be announcing the arrival of another crafty soul seeking refuge! The chores do need to be done, I get that, but make a deal with yourself: Give yourself a couple of hours once a week, ideally on a Monday, Thursday, Saturday or Sunday. Pack yourself a little bag of crafty bits– yarn, fabric, paper– whatever you like to work with, and make an appointment with yourself at the Unravel & Unwind Drop-In. You could even bring a like-minded friend. There’s plenty here to try. Unravel & Unwind has a very yarny vibe to it, this is true. But if Knitting and Crochet aren’t your bag, you will be pleased to see our resident papercrafter running the drop-in. That’s me, by the way, Sy. The strange American one on the recent Monday Morning Chit Chat. When I’m not listing events or writing blog posts, I am elbows-deep in paper. Whatever I am working on, I would be happy for you to join in with me and who knows, you might discover your inner papercrafter too! I also have yarny skills. There’s very little in the crafty realm that I haven’t done, so you can pick my brain about just about anything. Drop-in starts at £3. You can stay as long as you like from 10 – 4 for this price, although I usually bow out around 2 after my relief crew arrives! If you would like to use the studio supplies and resources, an additional donation would be welcome and the suggested amount is £2. If you discover something new and you would like to take it further, we can come to an arrangement for one-on-one or small group workshops. The great thing about Unravel & Unwind is the potential for creative activities. Let’s get making!